We care a lot about our prints. Each print is carefully hand packed and sent by registered mail. The small prints are packed in a protective nylon pack and put in a cardboard box. 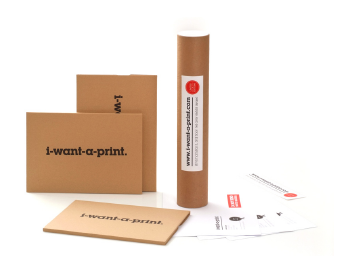 The medium and large size prints are rolled with brown paper and put in a cardboard roll. Our packaging ensures that no damage occurs during delivery. Shipping may take up to 7 days. In most cases shipping time will be shorter. If you choose FedEx as courier, the package should arrive at your doorstep within up to 3 days from shipping. If you choose airmail delivery, the package could take up to 3 weeks after shipping to arrive at its destination. You can also track your order on-line (available via FedEx only). and we promise to do our best to speed up the delivery.